It feels as if there has never been as much cricket being played as there is right now. Test series all over the globe, the women’s Twenty20 World Cup just finished in the Caribbean, a smattering of Twenty20 and even T10 leagues. And the promise of a World Cup and the Ashes next summer to come. Thankfully it is still the longer form of the game that attracts most attention. Whether it be Zimbabwe winning their first Test in five years by beating Bangladesh in Dhaka, Australia’s heroic rearguard in the UAE, or New Zealand pipping Pakistan by four runs – the fifth-smallest winning margin in the history of the game – Test cricket appears to be back and to be relevant. And leading the charge in its resurgence are England, who are reimagining the way five-day cricket is played, completing a whitewash in Sri Lanka. A combination of picking horses for courses (their spinners took 49 of the 60 wickets to fall, with four run outs) and an attacking mindset that has percolated through from their one-day cricket – along with a plethora of box-office all-rounders – has made Joe Root’s men as enjoyable to watch as their white-ball counterparts. The strides made by women’s cricket, including a bid to be part of the 2022 Commonwealth Games, is another new and uplifting part of the cricketing landscape. There is, as ever, a word of caution: the final in the Caribbean was contested by England and Australia, the two best-funded sides and the only two nations with high-level T20 leagues. The gap to the rest is wide and needs addressing – no easy task and one to keep an eye on. In this issue of the Nightwatchman we look at the origins, some 80 years ago, of how women’s cricket has got to where it is, and feature a series of photographs that chart the development of the women’s game. And we’ve got plenty more besides, of course. We are in the Caribbean, at the decaying Bourda cricket ground; in Australia, trying to get inside the head of David Warner; we chance upon a game by the Golden Gate Bridge in San Francisco; land in South Africa at the start of the ’70s where cricket and politics became indelibly linked; and we travel between the streets of Lahore and a Balham kebab shop for a story of what might have been. Elsewhere we have a one-armed cricketer, the tale of an embittered county player who gets a revenge of sorts, and a look back at those professional cricketers who were left with the choice of the workhouse… or worse. But for me the stand-out piece is an exploration of Bradman’s 99.94 Test batting average and how it is unlikely, going by contemporary accounts, that he (or anybody!) even knew what was at stake as he walked out to bat in his last innings. In a sporting world where stats are king, it is extraordinary to think that in 1948 – still in living memory for many – they were largely an irrelevance. The world changes fast. 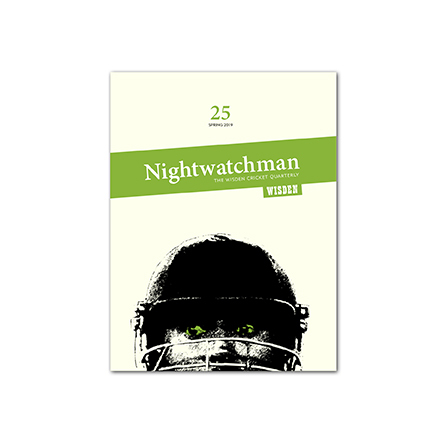 Issue 24 of The Nightwatchman is out now and available to buy here.